SMARTY Trend head unit overview for Lexus RX IV 300. Lexus RX IV 300 2018 is a great, modern car. It combines characteristics such as excellent build quality, modern design and economical fuel consumption is one of the key advantages of this car. There are several variations on picking the most popular ones are Standart and Luxury, but even in cases of the latter, despite the large staff monitor, the functionality of the device itself leaves much to be desired. If we take into account the fact that the head unit is produced in 2018, the price of replacing head unit among the representatives is extremely high. The company SMARTY Trend will help you to choose the head unit for your car, with an optimal device of price and quality. 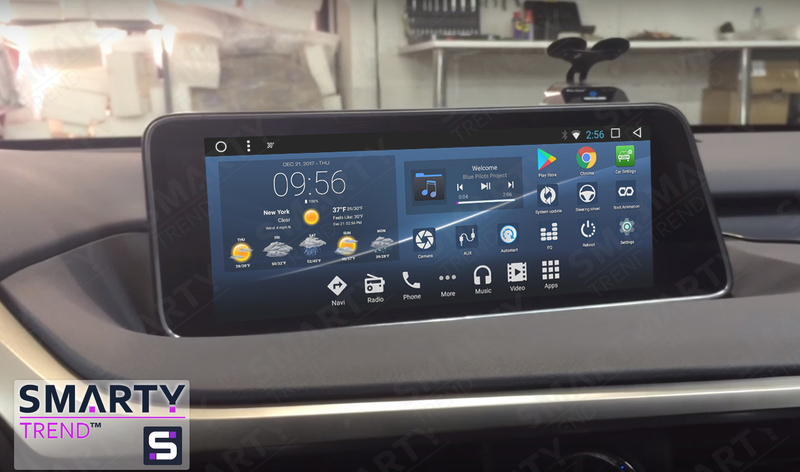 Despite the fact that the car is brand new, we present to your attention the head unit SMARTY Trend, for your car. There are several points that concern the installation of the device. The most important factor is the availability of a regular AUX, without this function, the sound in the Android system will not work. The installation process is no problem, everything you need comes in the kit and connects on the principle of the connector in the connector. Receivers SMARTY Trend support all regular functions of your car. Climate control, a standard rear-view camera and steering buttons will work in normal mode. Concerning non-standard complete sets, please specify the information. The quality of the materials used is not inferior to the standard ones, and the sound quality after replacement of the head unit becomes better thanks to the HI FI processor with a 12-band equalizer. The main feature of this unit SMARTY Trend, is the integration of the Android system in the car. Namely, it is saved by the joystick control, and even in Android. Also complete integration and support of all regular systems of the car is carried out. To go, and a full-time system, you must use the menu button, namely, clicking on it performs the transition between the standard and Android system and back. There is a choice of several graphical interfaces for SMARTY Trend head unit. Thus, this device is fully integrated into the car with the ability to maintain control of the entire standard system of the car. This unit SMARTY Trend is a great solution for this car. Support for standard features, a huge number of applications from the Google Play Market, support for a standard car system. These are key features of the head unit. Installation takes place without problems, with no gaps. The company SMARTY Trend is an ideal ratio of the price and quality. Use the technology of tomorrow today!